Now that roofing material has changed to mostly fiberglass and limestone we are seeing more homes with mold issues. Limestone is the algae’s food source. 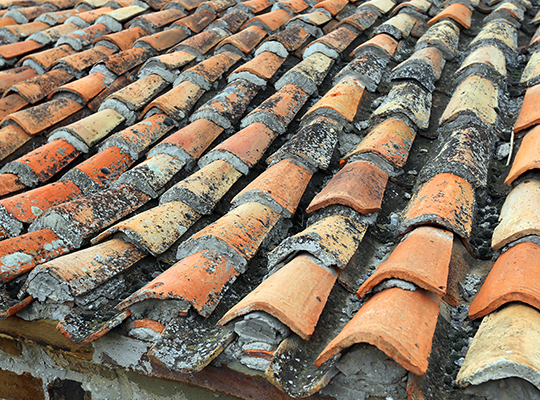 The change in the way that roof shingles are made has allowed the growth of fungi, mold, and algae to thrive more easily. Algae needs three things to grow: heat, moisture, and nutrients. Asphalt was soaked into a mat made from felt containing cotton or wool fibers. An inorganic fiberglass mat is coated with asphalt that is then covered with a protective layer of U.V. resistant, colored ceramic granules. Limestone is used as an inexpensive void filler between individual fiberglass mats. It also provides resistance to fire and weather. Unfortunately, limestone is a favorite food for “Cyanobacteria Gloeocapsa Magma”, roof algae. 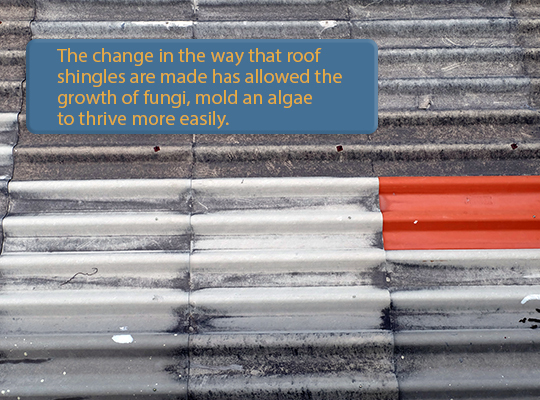 Prior to 1978, Cyanobacteria would starve to death when it landed on your roof – now it thrives on your roof. As the algae grow, it holds moisture allowing the growth to accelerate. Schedule a mold and algae inspection today with HomeMD!